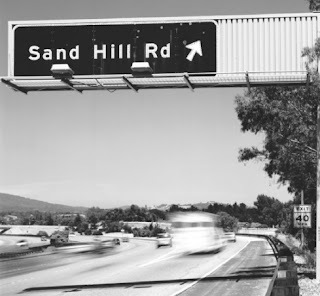 Sand Hill Road is the home of many Bay Area VCs ©. I spent two days on Kellogg's Venture Capital (VC) trek to the Bay Area. We visited a broad range of firms, from life science centric Alta in San Francisco to typical residents of Sand Hill Road, such as Battery. I've summarized my main take-aways from the trek into the broad areas of (1) startups and investing (2) hot areas of (high tech) investment (3) getting a VC job and (4) some other points. Many thanks to Windsor and Thupil for organizing. If the area that you are looking at is trendy now, it is too late – the opportunity has already passed. You need to be ahead of the curve. The VC looks for people who have powerful market insights – people who know something more in the area than the average top tier person. The VC invests in people who they think can solve the problem in the area, not in a specific business plan. Most sectors are cyclical. The question is how long is the cycle? For clean tech this could be 20 years, which is too long for a VC backed fund. When the VC invests, they have to believe the company can become a billion dollar company. They play for big hits, knowing only a small portion will become big hits. Success happens to you. Only when you fail do you learn something. Doing something (e.g. a startup) and failing teaches you things that are invaluable about how startups work. Hot areas of (high tech) investment. Two areas of high tech investment stood out in particular across the firms. Mobile: All the things that we needed on the Internet in 2000, we'll need on mobile in the not too distant future, e.g. payments, advertising, commerce. The opportunity is in figuring out how these things might work on mobile. Enterprise: virtualization and cloud computing are hot in this area. In the past, to win money from enterprises, it was necessary to approach IT departments and win over large amounts of money for large contracts, e.g. a SAP implementation. What we are now seeing is individual business units buying SaaS software for small amounts of money, e.g. entry level SalesForce. Because the level of enterprise sign-off required for small amounts of money is low, it is easier to get these transactions done. Jobs at VCs usually open up as a need arises for particular skills or expertise. When that hole opens up at a VC firm, you have to be the right peg to fit that hole. Sometimes that openings won’t match your skillset. In the meantime, you have to keep developing yourself until the opportunity arises. You have to keep yourself at the top of VC’s minds, perhaps dropping them an email every quarter. While you’re not yet working at a VC firm, you have to become an expert, perhaps in a particular domain or in human-issues of startups. You have to place a bet on what kind of skills will be useful in 2 or 3 years out, and start developing the skills for that area. Sales and operating experience are two generally very useful experiences for rounding out your skill-set. While fund sizes get bigger, the number of quality opportunities does not. In the future, the number of VC firms and the amount of money in VC will need to reduce if the industry is to return to reasonable returns. In the meanwhile, VC firms are other ways to deploy this extra capital efficiently. For example, VC firms are building to Entrepreneur-In-Residence programs and using those to start businesses in which they own a much larger share than they might otherwise. VCs come in all shapes and sizes, from very slick to the nerdy. The backgrounds of VC are very varied, and the stories of how they got into VC is just as varied. For LPs, the most important thing to them is a VC being able to show them exits.